Today’s post was written by Tamara Sullivan is the dean of E-Learning at Ormiston College. Last year, I was very excited when I received my Office 365 account. I loved the new collaboration features, especially the ability to easily share and collaborate in OneNote notebooks with my students. But it wasn’t until the end of the year that it dawned on me that sharing feature opens the doors for students to easily create, connect and collaborate with students around the globe—all through the one platform. What is more exciting is the ability to collaborate with a school, even if they do not have OneNote installed on their machines. Running through a web browser with OneNote Online means that any student, with any device can participate. And it is free! It was at this point, I started thinking about the type of collaborative tasks that would be possible using OneNote Online to foster global collaboration among students. The first activity I created was a student peer feedback task. I wanted my students reflect on their own efforts, and extend and enrich this reflection by exchanging feedback on their own and peers’ work. So I joined forces with a school in Sydney and fellow Microsoft Expert Educator to put this to the test. The first step was creating a collaborative OneNote notebook and sharing the link via email with my students and the collaborating school. 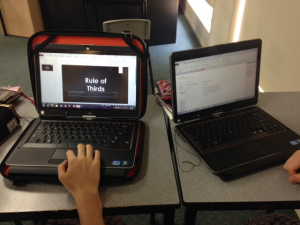 Next, my students created Office Mix tutorials on content we had studied in class and then shared the link to their tutorials in the OneNote notebook. Via the shared OneNote, the collaborating school viewed the tutorials and created their own products for my students to critique. Likewise, the collaborating school critiqued my students’ tutorials. The students’ level of engagement with the task was astounding. It allowed the opportunity to discuss with my students effective feedback and how to reflect on, and critically evaluate their own learning and skill development. In each lesson, the students were very eager to access the notebook to view the collaborating students’ products and view their own feedback. I then considered what this task would look like with a global audience. I realized that the multimodal tools and features allow students in any learning area and year level to participate in the same task. OneNote is not restricted by location, time or language, and the multimodal tools allows students to express their ideas in a variety of formats. It is the perfect platform for fostering online learning to increase cultural understanding and global collaboration among students. If you take the same peer feedback task, a class in Germany can collaborate and connect with students in their native language. Students write feedback, then the collaborating school highlights the text and using the translator tool, they can convert the text to their own language. In the younger years, teachers can create and share a collaborative notebook with a school to jointly work on projects. In this example, the class completes a weather diary from around the globe using the drawing, audio and video tools. The teacher uses this data to discuss seasons. For the math class, students collaboratively work together to solve higher order thinking problems. Using the drawing tools, they can solve problems, share strategies and provide feedback. For the language subjects, students participate in a language exchange by buddying up with a partner to practise and converse in their chosen language. Peer feedback on writing tasks. Comparing data in catchment areas in geographically diverse areas. Interview a person in another country to develop intercultural understanding. Creating daily news reports to share with another country. Creating content for the younger students. Microsoft OneNote provides a platform to bring the outside world into your classroom, and to create an environment, which promotes cross-cultural interaction and real life contexts for collaborative learning. How will you use OneNote to create the connected learner? Check out my Sway on this use for OneNote in and out of the classroom here.